All Decked Out is one of the best pergola builders in Melbourne. We will design and build a pergola to your custom requirements. 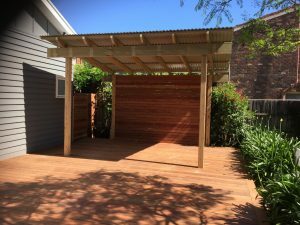 From a stand-alone pergola as a garden feature, to a verandah providing shade in the summer from the sun, and protection from the rain in winter. to a carport for your vehicle. We also build carports. All our carports are designed to compliment and enhance your home. In addition, they are built to protect your vehicle from Australia's harsh elements. 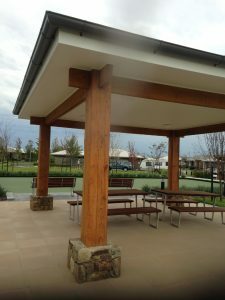 At the heart of any pergola is a desire to enhance a home and provide an outdoor living space. Most pergolas have some overhead covering, This is usually a roof for weather protection. Alternatively, they may have a lattice. This is usually done to grow a trailing vine. As we are specialised pergola builders we will build whatever style of pergola you desire! This is especially important, as most pergolas need be customised. This is because they need to be built to suit the their location and purpose. Pergolas are often confused with verandahs. The main difference is that a verandah is always attached to a house. In contrast, a pergola can be a stand alone building. Most pergolas are designed to provide an outdoor living space or alfresco kitchen where people can enjoy the outdoors as an extension of their living space, whilst having some protection from the weather elements. This requires a balance of openness and protection in the design of the verandah. Having open sides on your pergola allows natural air flow and cooling. However, windy conditions, rain and cool weather can reduce your enjoyment of the space. 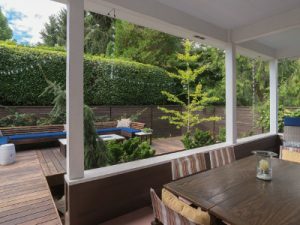 For this reason you may decide to have protective walls in your pergola. This is especially important if you are using the area as an alfresco kitchen. 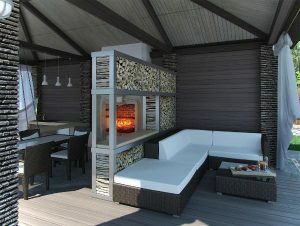 It will mean that you will be able to use your outdoor space even when Melbourne weather is not at it's best! Often, pergolas have a roof. However this is not always the case. Different designs can be integrated into the lattice and frame of your pergola to make it visually appealing. Common styles for pergola roofs include flat, curved, gable and cantilevered. Roof sheets on pergolas provide improved protection against the sun in summer and the rain in winter. Colorbond roofing is a popular choice for pergolas. Colorbond comes in a variety of colours and corrugation styles. This means Colorbond roofs can be matched to most styles of homes to provide a long lasting roof. As Colorbond roofing blocks direct sunlight, if light is important, an alternative form of roofing will be requiried. A popular option for pergola roofing is Laserlite. This is a hard transparent plastic which comes in a range of tints. The range is from clear to gun metal. Laserlite is made in corrugation sheets. This means it provides protection against sun glare, rain and falling leaves without blocking out the direct sun. Alternatively, you may want a natural solution. This is achieved with a trellis for growing plants on for your new pergola. This alternative is best done with deciduous plants like wisteria to improve winter sun and reduce sun penetration in the hotter months. When roofing is used on a pergola, thought needs to be given to where the water will go when it rains. Gutters and down pipes need to be incorporated for storm water. Sometimes you can connect to an existing system, but this depends on the roof heights. 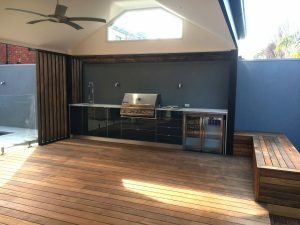 Other options for your pergola include collecting the water to fill a swimming pool or getting a rain water tank to water gardens and lawns from. Pergolas can be constructed from almost any material. Timber options include all the varieties of hardwood used for decking. However, the options also extend to softwoods like radiata pine or oregon. Most pergolas have a painted finish for colour selection and ease of maintenance. Timber pergolas can be varnished with or without a stain. If a stain is not used, the grain of the wood is visible. All Decked Out are will design and build a pergola to meet all your specific requirements.